The traditional Jewish New Year is upon us. It’s called Rosh Hashanah in Hebrew and Rosh Hashoneh in Yiddish. The sons and daughters of Jacob nibble apples and honey as they hope for a sweet year. Synagogues register their highest attendance as the High Holy Days or ‘Days of Awe’ approach. The Day of Atonement (Yom Kippur or Yom Hikippurim) draws close and with it a heightened awareness of sin in the Jewish community. Rosh Hashanah’s deeply moving traditions, liturgy and celebrations are a rich part of many Jewish people’s lives. Even some Gentile believers in Yeshua love the seasonal celebrations. But, like many pious celebrations in other religions, the Bible often plays second fiddle to men’s traditions. The Hebrew Bible tells us that the Jewish New Year is not in Tishrei (which it calls the seventh month) but 14 days before Passover, in the first month of Spring (which is called Aviv in the Bible (Exodus 12:1-3; 13:4). 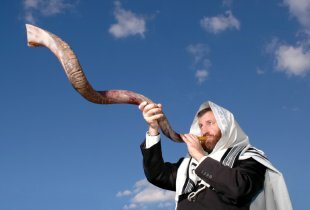 What is today called Rosh Hashanah is actually what the Bible calls ‘the Feast of Trumpets’ (or the ‘Feast of Blowing’ of trumpets). It is the fifth Feast in the biblical calendar (Leviticus23:23-25). It occurs in the biblical month called Eitanim (which means ‘the strong ones’ in Hebrew – see 1 Kings 8:1-2). How did this all get switched, and who made off with the real biblical Jewish New Year? What about the Feast of Trumpets? Does the Bible tell us how to celebrate it? How can we interact in a user-friendly way with Jewish tradition? When Israel returned from Babylonian Exile, according to Rabbi Hanina bat Hama (d. 250 A.D.) “the month names came up with them [with the exiles] from Babylon” (Jerusalem Talmud, Rosh HaShanah 1:2, 56d). Babylonian names were gradually switched for the original Hebrew names after the days of Ezra and Nehemiah. Today eight of the twelve original Hebrew names of the months have disappeared. The Babylonian month names are for the most part names of Babylonian demons (https://en.wikipedia.org/wiki/Babylonian_calendar), even as most modern Western months are based on Roman gods (https://en.wikipedia.org/wiki/Roman_calendar), while European days of the week are taken from Norse and Germanic gods (https://en.wikipedia.org/wiki/Names_of_the_days_of_the_week). The Babylonian royal calendar began its year in Tishrei (biblical Eitanim) and so the Jewish people gradually fitted in to this accepted international calendar. The influence of the Exile and our sojourn in Babylon ended up shaping medieval and modern Jewish history. But when YHVH brings full restoration to His Jewish people, He will make some changes in our calendars and in our feast days, as Zechariah prophesied in Zechariah 7:1-6; 8:18-19. Part of that restoration will involve a return to YHVH’s original calendar in Leviticus 23:2: “Speak to the sons of Israel and say to them, ‘YHVH’s appointed times which you shall proclaim as holy convocations – My appointed times are these…” As Paul says, “For the gifts and the calling of God are irrevocable” (Romans 11:29). God joins two powerful works of salvation and rescue within the first month of the Hebrew calendar – the rescue of the Jewish people from slavery to Pharaoh and the rescue of the Jewish people from slavery to sin by Messiah Yeshua (“She will bear a Son; and you shall call His name Yeshua, for He will save [in Hebrew, yoshiya”] His people from their sins”; Matthew 1:21). What a festival to sing YHVH’s Redemption Song! Two passages help us to understand the biblical focus of the Feast of Trumpets – Leviticus 23:23-25 and Nehemiah 8:8-12.
in modern English a specially called for meeting with a holy and set apart purpose. The ceremonial activity connected to blowing of trumpets or shofars here is zikaron teru’ah, a memorializing through a noise called teru’ah. Teru’ah can refer to a shofar blast (Leviticus 25:9; Hosea 5:8; Psalm 81:3/4), a great shout of joyous praise (2 Samuel 6:15; Ezra 3:11; Job 8:21; Psalm 27:6), or a resounding cymbal clash (Psalm 150:5). The word speaks of explosive and joyous power, and usually refers to an extremely positive sonic event. Nehemiah grants us deeper insight into God’s intentions – how to celebrate the Feast of Trumpets. Then Nehemiah, who was the governor, and Ezra the priest and scribe, and the Levites who taught the people said to all the people, “This day is holy to YHVH your God; do not mourn or weep.” For all the people were weeping when they heard the words of the Torah. Then he said to them, “Go, eat of the fat, drink of the sweet, and send portions to him who has nothing prepared; for this day is holy to our YHVH. Do not be grieved, for the joy of YHVH is your strength.” So the Levites calmed all the people, saying, “Be still, for the day is holy; do not be grieved.” All the people went away to eat, to drink, to send portions and to celebrate a great festival, because they understood the words which had been made known to them (Nehemiah 8:8-12). The God of Jacob lays it all out for us here. This is not a day for tears or fears. It is not a day to be afraid, to grieve or to mourn. It is a day to eat rich food, to drink sweet-tasting beverages, and to have a huge and joyous celebration. In short, YHVH is calling on His people to have a holy party! In Nehemiah this party follows immediately on the heels of a national revival. The people had just heard the words of Deuteronomy 27-28. They understood that there was a good reason for the punishment of Exile, and they immediately repented of their national rejection of His prophets. Today that same national call stands before our Jewish people – to realize that our Exile to America, England, Argentina, Russia, South Africa etc. – is due to our leaders’ rejection of the message of the Prophets and of Messiah Yeshua (Matthew 23:34-39; Mark 12:1-12). We as a nation have followed our leaders in their bad decision. The need of the hour for us is national repentance. The need of the hour is to wake up and realize that our existence in the Exile is like that of a bird in a gilded cage. The God of our Fathers is calling us home – home to Him and Home to our homeland! When Israel’s spiritual leaders rejected Yeshua Son of David as Messiah, He nevertheless offered Himself up for His people as our atonement. But the majority of the Pharisees could not see this or accept His gift. In the words of the Prophet, they created for themselves an alternate Judaism, one which astoundingly forsook the Redeemer of Israel: “My people have committed two sins: They have forsaken me, the spring of living water, and have dug their own cisterns, broken cisterns that cannot hold water” (Jeremiah 2:13). Yom Kippur was gradually transformed into a fast day where people try to earn their own atonement. Rosh Hashanah became a day of pre-atoning preparation for the Great Fast. God’s joyous invitation is still extended to Israel to celebrate with a thankful heart. But His offer has for the most part fallen by the wayside. Even today, many Messianic Jews are influenced more by rabbinic thought and tradition than by God’s gracious bidding to throw a holy party of thanksgiving.